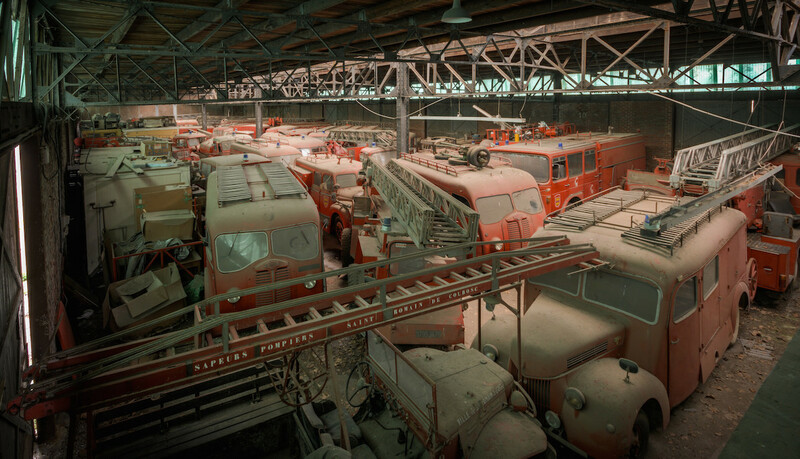 The Hidden Glasgow Forums • View topic - The Dusty Graveyard Of The Big, Red Firetrucks. Why is Glasgow History sitting there, gathering dust ? Get them out, tart them up and put them on display, somewhere ! The writing on the ladder near the bottom of the photo is French, so I'm guessing that's not Glasgow! We could build a big museum and stick them up the wall so nobody can see them. This Aladdin’s cave of rare automobiles is likely one of several. In the 1990s, the French fire departments raised funds in an effort to restore and preserve their retired old trucks to be sent off to museums but in the early 2000s, that initiative ran out of money and went bust. The trucks that weren’t in good enough condition were sentences to the scrapyard rather than being sold to the public, and the rest were sent to storage sites like this in the event that maybe, on the off chance, one day a museum might come along and save them.